There has recently been something of an uproar over the new book A Troublesome Inheritance by Nicholas Wade, with much of the criticism centering on Wade’s claim that race is a meaningful biological category. This subject is one with which I1 have some personal connection since as a child growing up in South Africa in the 1980s, I was myself categorized very neatly by the Office for Race Classification: 10. A simple pair of digits that conferred on me numerous rights and privileges denied to the majority of the population. 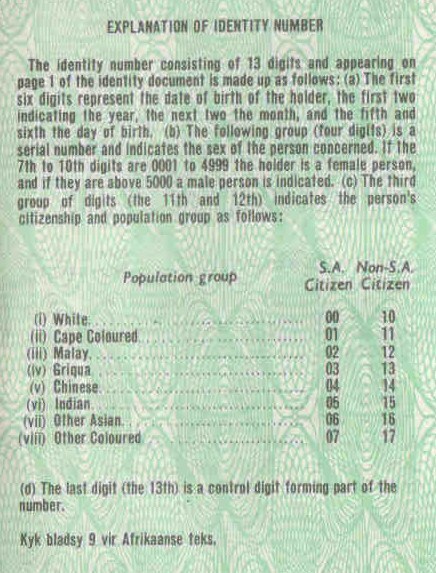 Explanation of identity numbers assigned to citizens by the South African government during apartheid. With these memories in mind, I found Wade’s concept of race as a biological category quite confusing, a confusion which only deepened when I discovered that he identifies not the eight races designated by the South African Population Registration Act of 1950, but rather five, none of which was the Griqua! With the full force of modern science on his side2, it seemed unlikely that these disparities represented an error on Wade’s part. And so I was left with a perplexing question: how could it be that the South African apartheid regime — racists par excellence — had failed to institutionalize their racism correctly? How had Wade gotten it right when Hendrik Verwoerd had gone awry? Eventually I realized that A Troublesome Inheritance itself might contain the answer to this conundrum. Institutions, Wade explains, are genetic: “they grow out of instinctual social behaviors” and “one indication of such a genetic effect is that, if institutions were purely cultural, it should be easy to transfer an institution from one society to another.”3 So perhaps it is Wade’s genetic instincts as a Briton that explain how he has navigated these waters more skillfully than the Dutch-descended Afrikaners who designed the institutions of apartheid. One might initially be inclined to scoff at such a suggestion or even to find it offensive. However, we must press boldly on in the name of truth and try to explain why this hypothesis might be true. Again, A Troublesome Inheritance comes to our aid. There, Wade discusses the decline in English interest rates between 1400 and 1850. This is the result, we learn, of rich English people producing more children than the poor and thereby genetically propagating those qualities which the rich are so famous for possessing: “less impulsive, more patient, and more willing to save.”4 However this period of time saw not only falling interest rates but also the rise of the British Empire. It was a period when Englishmen not only built steam engines and textile mills, but also trafficked in slaves by the millions and colonized countries whose people lacked their imperial genes. These latter activities, with an obvious appeal to the more racially minded among England’s population, could bring great wealth to those who engaged in them and so perhaps the greater reproductive fitness of England’s economic elite propagated not only patience but a predisposition to racism. This would explain, for example, the ability of John Hanning Speke to sniff out “the best blood of Abyssinia” when distinguishing the Tutsi from their Hutu neighbors. Some might be tempted to speculate that Wade is himself a racist. While Wade — who freely speculates about billions of human beings — would no doubt support such an activity, those who engage in such speculation should perhaps not judge him too harshly. After all, racism may simply be Wade’s own troublesome inheritance. 1. In the spirit of authorship designation as discussed in this post, we describe the author contributions as follows: the recollections of South Africa are those of Lior Pachter, who distinctly remembers his classification as “white”. Nicolas Bray conceived and composed the post with input from LP. LP discloses no conflicts of interest. NB discloses being of British ancestry. 2. Perhaps not quite the full force, given the reception his book has received from actual scientists. 3. While this post is satirical, it should be noted for clarity that, improbably, this is an actual quote from Wade’s book.